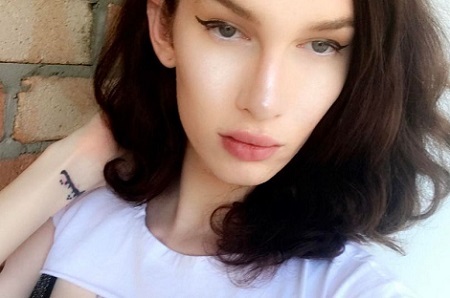 A transgender woman has spent nearly £55,000 on bum implants, nose jobs and jaw slimming procedures in a desperate quest to look like a Bratz doll. Jolene Dawson had most of the cosmetic surgery in the space of six months when she was just 19. Now 21, she wants to have her Adam's apple removed and belly button "sewn up" to complete the look. Jolene, of Gold Coast, Australia, has long wanted to look like a Bratz doll as she perceives the cartoons are "beautiful". "It was almost accidental at first. "As a child I really liked Bratz dolls. Then as I got older and realised that I wanted to become a woman, I started surgery to get the chin and the heart-shaped face," she told MailOnline . She added: "Growing up as a boy, I never really thought about [playing with Bratz dolls]. "But then, when I watched the cartoon, I realised they looked look like what I saw as beautiful." Jolene has forked out thousands on other beauty treatments, such as full-boy hair removal and breast augmentation in the past few years. She has now had four nose jobs, which altogether have cost almost £5,000. Jolene added that she had "always been really confident" and said if somebody doesn't like her "it’s more a missed opportunity for them". Jolene, who is currently single, said she is always "100% open" with potential partners.